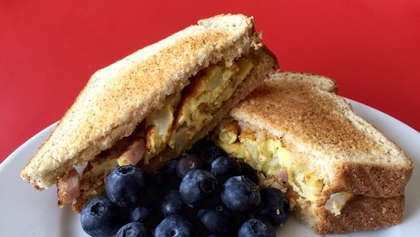 Gather your classic breakfast ingredients to assemble this great-tasting sandwich. And who says you can't have it for lunch or dinner? Heat small nonstick pan over medium heat (coated with small amount of butter or cooking spray). Add salt, pepper, onion and ham to whipped eggs and pour into pan. Allow egg mixture to set. Flip egg mixture to cook on reverse side until liquid is gone. Butter one side of each piece of toast. Place egg mixture between buttered slices of toast. Traditionally served dipped in ketchup.